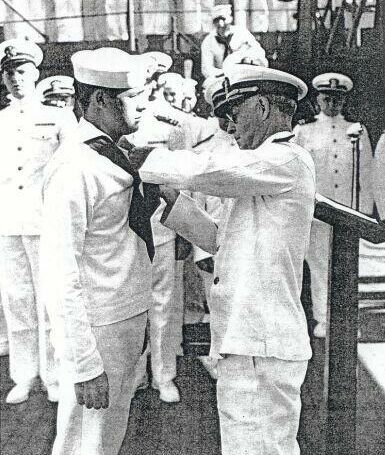 Harry Paul Bush, Baker 2nd Class, was presented the Purple Heart medal by Rear Admiral Ernest G. Small in recognition of wounds received on board the USS West Virginia at Pearl Harbor on Dec. 7, 1941. Award took place on the USS Salt Lake City in the Pacific on Oct. 21st, 1943. Picture below.